Collection of homilies and commentary on the Bible. f. 1r-114v: Homilies on Genesis and Exodus. f. 117r-121r: Homily delivered in 1560 for exiles from Catalonia. f. 121v-127r: Homily delivered on New Year’s eve in 1559.
f. 127v-136r: Homily for the wedding of Solomon Tarfon, 1554.
f. 138v-144r: Annotations for an obituary for the wife of Meir Aramah, 1556.
f. 144v-148v: Obituary for Moses Gerson of Lisbon. f. 149r-165v: Obituary for Perahyah Hacohen. f. 166r-167v: Commentary on Daniel. f. 168r-170r: Commentary on Lamentations. f. 170v-172v: Commentary on Esther. f. 208v-209v: Homily for the wedding of Samuel ben Menahem Kalman. 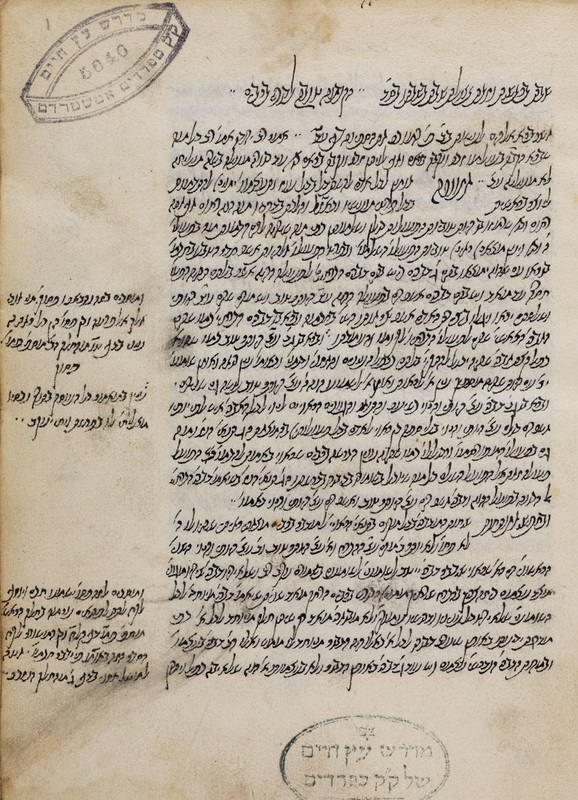 f. 210r-211r: Obituary for a woman named Nehamah. writing / No title / Catchwords at the end of each folio.